Place Vendôme has long been home to the world’s most important jewelers. Cartier, Tiffany, Van Cleef & Arpels…all are in this elegant Parisian square. But Frederic Boucheron, who set up shop in 1893, was the first. Although he had already been in business for 35 years, by placing himself in one of the most elite neighborhoods in town he gained the attention of prestigious clients who frequented the area, including the Countess of Castiglione. Soon, royalty and notables were clamoring for Boucheron jewels. In 1894, the Tsar Nicolas II commissioned a pearl and diamond tiara for his fiancée, Alexandra, Queen Victoria’s granddaughter. She wore the extravagant coronet incessantly, saying it was the only cure for her migraines. After Frederic’s death in 1902, his son Louis took over the business. The house of Boucheron experimented with many styles and materials, and was a major contributor to the Art Nouveau and Art Deco movements. The exquisite, sophisticated designs continued to draw heads of state and VIPs from near and far. One such loyal client was Madeleine Astor, wife of multimillionaire John Jacob Astor IV. Mrs. Astor survived the sinking of the Titanic, but her husband, who gave his seat on the lifeboat to another woman, did not. Neither did her jewelry, which all disappeared into the sea—except for a sapphire and diamond Boucheron ring that she wore for the rest of her life in honor of her husband. Another important client was the Maharajah of Patiala, who was impressed by Louis Boucheron’s many journeys to India. He visited the Place Vendôme shop in 1928, accompanied by servants carrying thousands of diamonds, rubies and emeralds, and ordered 149 extraordinary jewels to be made from his stones. The house of Boucheron also captivated stars of stage and screen. Sarah Bernhardt’s love of the Animaux de Collection made the jeweled menagerie popular. 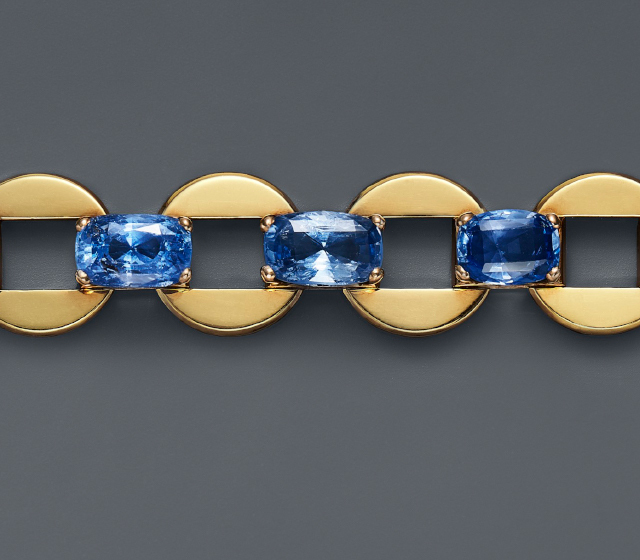 Joan Crawford treasured her Boucheron suite of aquamarines and diamonds and would often wear it on stage. In 1977, Andy Warhol bought the set in her memory, convinced that it held a part of her soul.